Villa Joelena is a perfect choice If you are looking for a relaxing holiday in the Cypriot countryside. The villa has a spacious outside area, large swimming pool and delightful mountain and distant sea views. The charming harbour of Latchi and the beach are just a short drive away and it is an amazing place if you are a seafood fan, which is very much the speciality of this charming fishing village. Pool heating, air conditioning/heating in the bedrooms and WiFi are included in this 3 bedroom villa. Cypriot countryside, mountain views from the spacious pool terrace and evenings dining out in one of the harbour tavernas. Perfect! The spacious outside area is surrounded by beautiful greenery, complete with a large pool and mountain views. The pool terrace is dotted with sun loungers and parasols and the shaded dining area is just outside the house. At one side of the pool is a large pergola with a further seating area - another great spot to enjoy the mountain views or dine alfresco. A few steps lead up to a covered porch and the villa entrance. The undercover parking area is at the side of the property. The lounge is spacious and comfortably furnished with a feature fireplace to one side. The open plan kitchen/dining area is furnished to a good standard and is equipped with all the modern appliances. There is a window from the kitchen to the pool area - great for keeping an eye on the little ones and enjoying the mountain views too! The villa has 2 twin bedrooms with pool and mountain views, which both share an adjacent bathroom. The double bedroom with an en suite shower room has views of the front garden. Villa Joelena is ideally located in a beautiful countryside setting just a short drive from Latchi Beach and the resort. The authentic village of Polis with its shops, restaurants and beach is a little further away. The villa setting is perfect for days out and discovering all those beautiful places in Cyprus! The villa is located a short drive from several mini markets in Latchi. Paphos Old Town, with its narrow streets and covered market, is worth a visit, with traditional shops where you can buy lace, local trinkets and little keepsakes of your stay in Cyprus. It is a great place for authentic souvenirs reminding you of your holiday. This delightful 3 bedroom countryside villa is just a short drive from Latchi Beach. Driving further east you will find the beach at Polis while heading south you will find the popular beach at Coral Bay. In Polis, there is go karting to try and parks where you can enjoy a picnic. Paphos Zoo is great for a day out. One of the 4 most popular water parks on the island is the Aphrodite Water Park in Paphos, which has an area and rides for smaller children such as slides, fountains, water guns, and even a slippery octopus to climb! For the bigger children or brave and adventurous adults there are whirlpools, kamikaze slides, wave pools and water chutes plunging down into the darkness! There are 3, well-established golf courses found in Western Cyprus and a further 2 courses in the Larnaca district of the island. Villa Joelena is not available to book for season as it is sold out. Take a look here at the Cyprus villas that are currently on sale. Magic Bowl situated between Latchi and Polis, this 6 laned bowling alley caters for all levels of expertise. Coaches are on hand to offer expert guidance for children and non-players. There is a snack bar on site and the alley is open 4pm till late on week days and 2pm till late at weekends. The outside space at the villa was very enjoyable, very private pretty garden, pool and eating facilities. 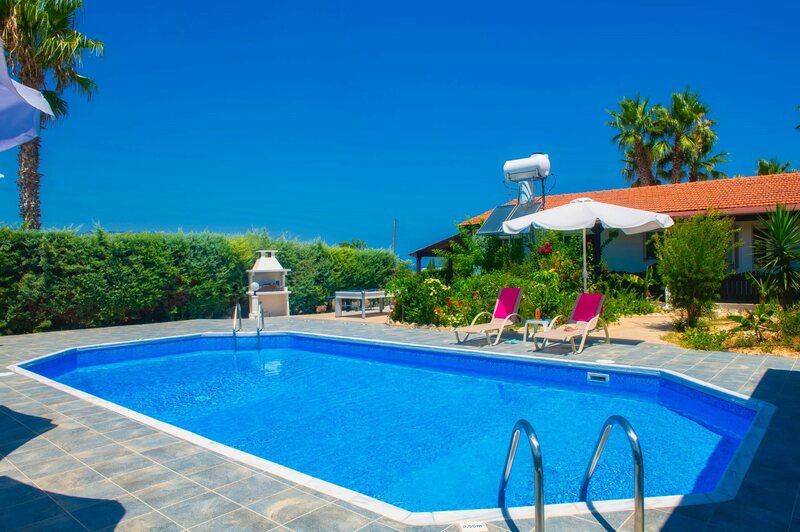 As always, the villa provided, met all of our requirements, it had great facilities, a nice location and we were very well looked after by both the owners who were extremely friendly and couldn't do enough for you and also by the Villa Plus rep and office staff. We had a great and relaxing holiday and would be happy to use your services again in the future. This villa really met our expectations, roomy, quiet, not overlooked, well maintained by the pool guy and owner and some view towards the sea. Latchi is lovely along with neighbouring Polis and not over-developed but with a good number of restaurants and beaches. This was our first trip with Villa Plus and have been impressed. Michelle the rep was also on hand if required. Would highly recommend this villa and Villa Plus.